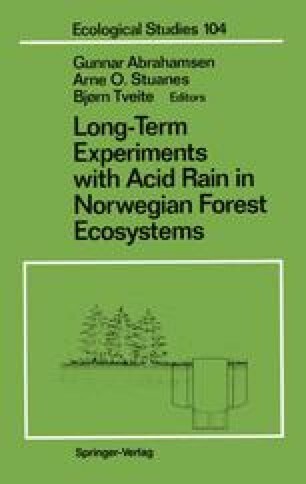 The main treatment in the five experiments and the field lysimeters was watering with artificial rain of different acidities. Quantities of 25 or 50 mm per irrigation were applied to experiment A-1 and lysimeter series 1. All the other experiments received 50mm artifical rain in each watering (Tables 3.1 and 3.2). At each location, unwatered plots served as controls for the effects of irrigation. None of the experiments were sheltered from natural precipitation. Liming with a single dose of crushed limestone (CaC03) at the beginning of the treatment was included in experiments A-1, A-3, B-1, and lysimeter series 2 (Tables 3.1 and 3.2).